On my walk past the Tokyo tower the other night, I went past a bright area I could see in the distance which my map informed me was Shimbashi. 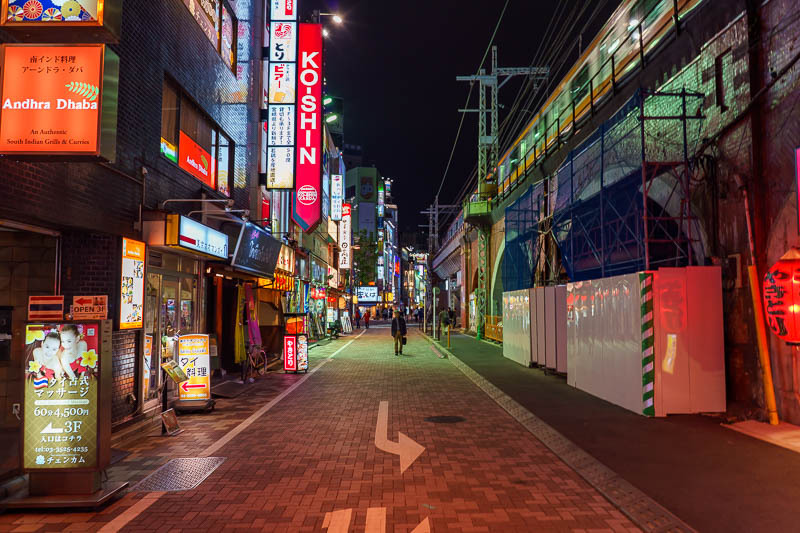 I googled it, turns out lots of people like to take cyberpunk fake blue colored BLADERUNNERESQUE photos there, and I had never been there before. How could I resist to make the same photos as countless others? 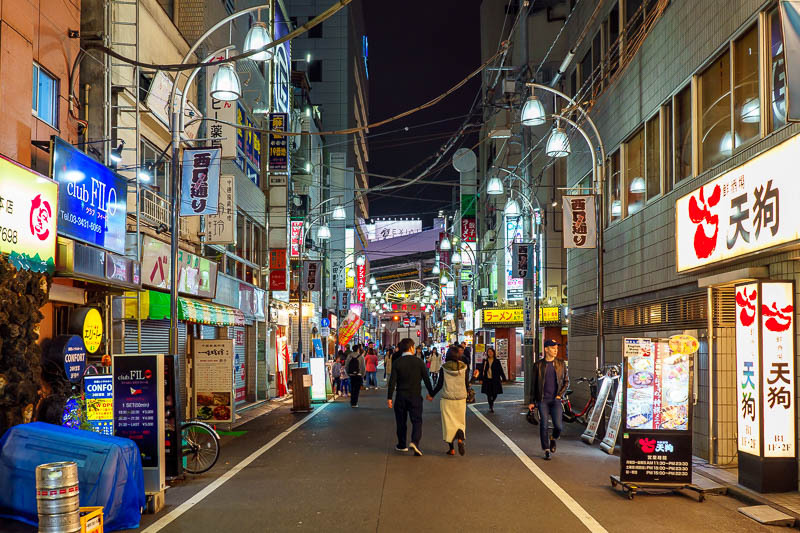 So this evening I decided to head to Shimbashi, it basically adjoins Ginza and Tokyo stations, the whole area is one big food, drink and shopping district, it just depends on if you want shiny (Ginza), Large (Tokyo) or grimey (Shimbashi), tonight I elected for grimey. The only problem was, much of it is shut on Sundays. I checked the signs on a few shops, open every night of the week except Sunday. 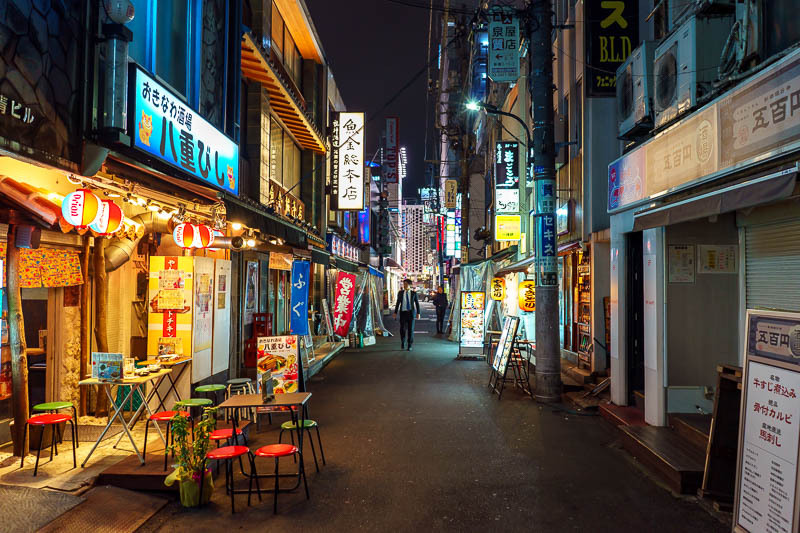 Did they start enforcing penalty overtime rates in Tokyo? 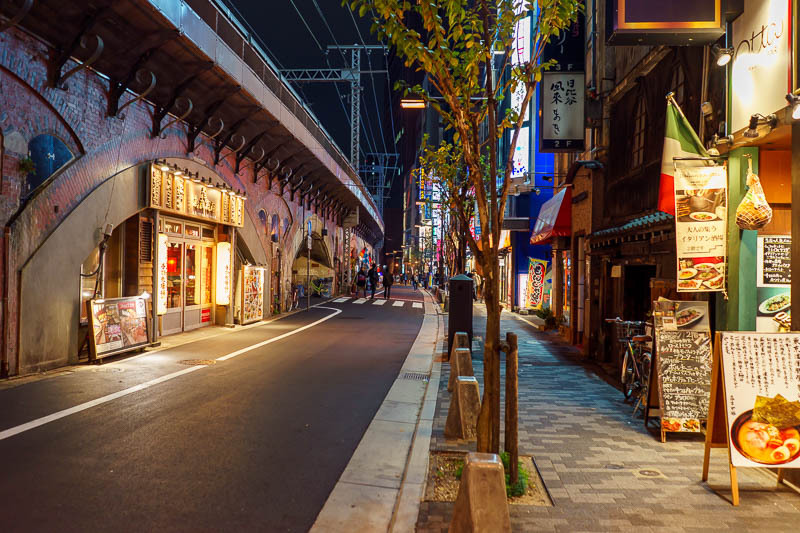 Anyway, I still found it interesting, and the walk to and from the area from my hotel in Kanda along the tracks provided lots of things to look at and every few seconds a train would go over head. Then I had my dinner, and half an hour later I am walking back up another street, and here she is again! Similar offers. I told her, I already told you to get lost. She says, in decent English, 'yes, but now you have eaten, perhaps you have more strength and are ready for action!'. First, by special request, here are some pictures around where I am staying in Kanda. 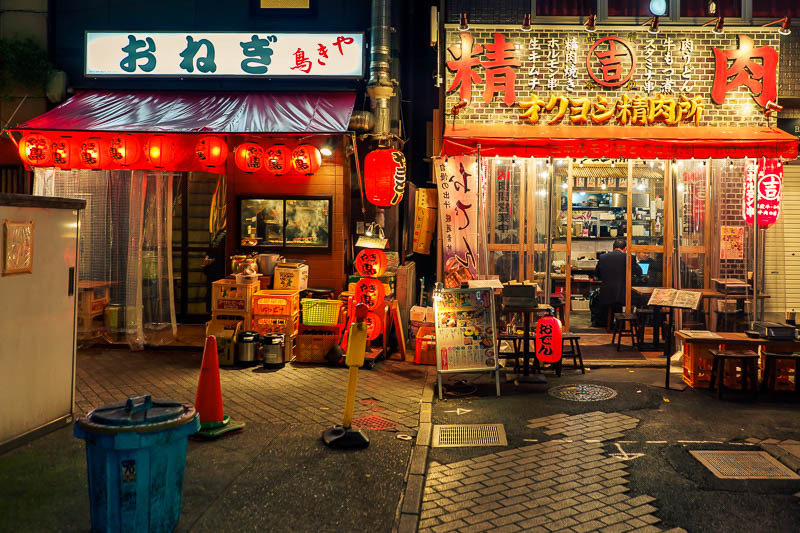 Much like Shimbashi, many of the places here choose to shut on Sundays. Last one, train going over head. 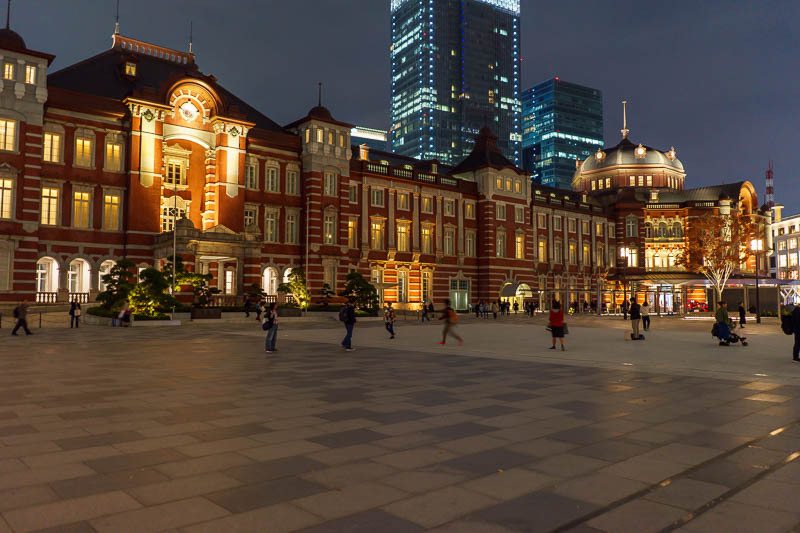 On my journey tonight I had to go into Tokyo station to buy my 3 day train pass that I will start using tomorrow. There was no one in the line but both open counters had someone being served. Both of those people were absolutely useless. One of them needed to get to Ueno station from Tokyo station, and was trying to buy a ticket and book a seat on the Yamanote line for Wednesday (3 days from now). The Yamanote line is the main metro line, there are definitely no reserved seats, and the train runs roughly every 28 seconds. Anyway, this photo came out pretty well for handheld. The next station along is Yurakucho. 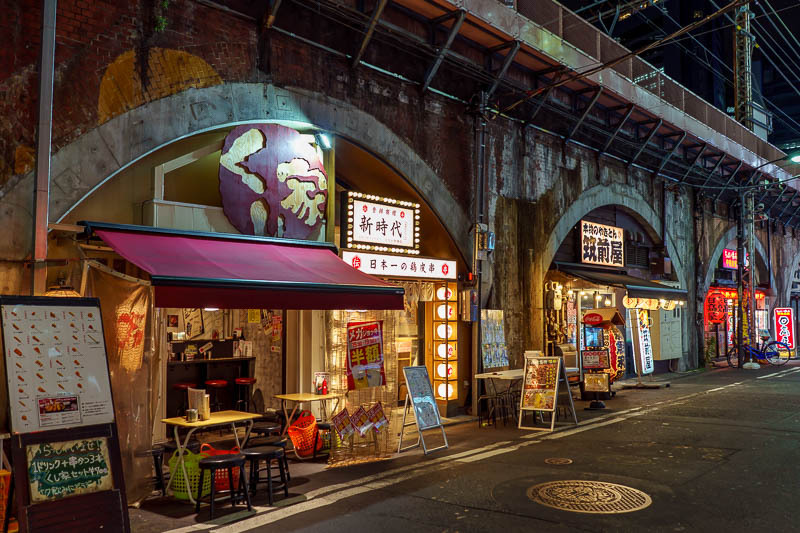 The train line provides hundreds of holes for small restaurants under the tracks. Here is a particularly low rent location with a low rent looking eatery. 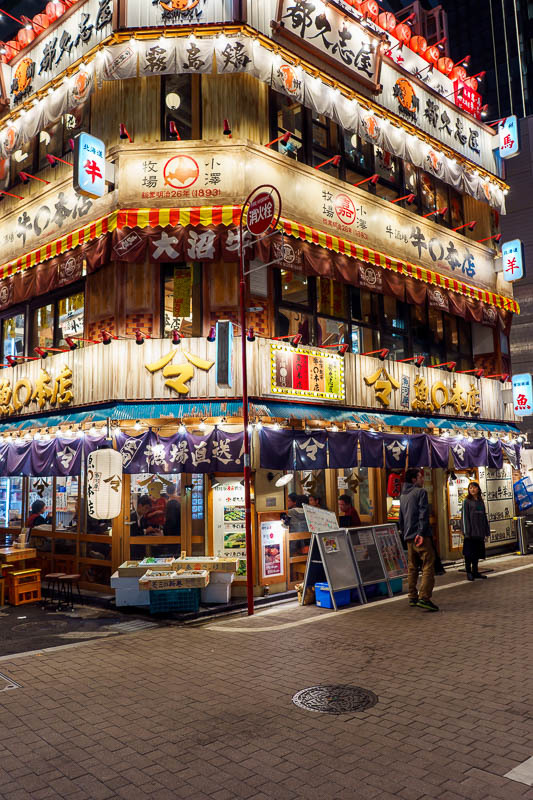 Near Yurakucho is one of these multi level seafood places. I think I have seen this exact same building in other locations. So now I think these 3 level restaurants are mass manufactured kit buildings made to look old and interesting. The back streets had some little places to take some atmospheric moody photos or whatever adjectives you want to use. 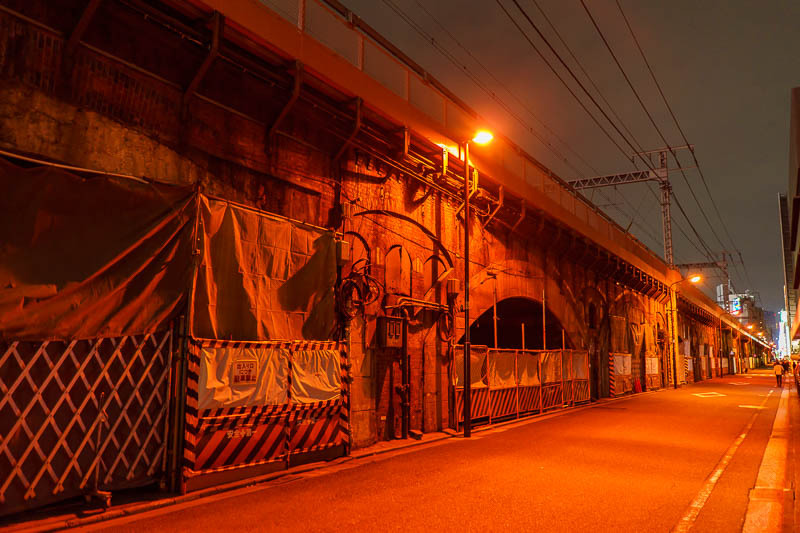 Between Yurakucho and Shimbashi on this side of the tracks they are renovating the under track tunnels, so its my chance to take a shot of nothing lit with sodium lights. 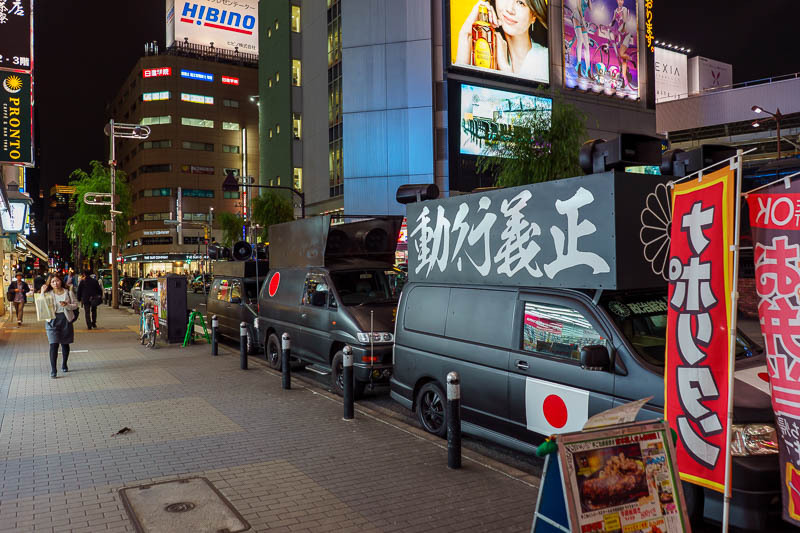 Once I got to Shimbashi I was greeted by the new imperial army, who have parked their hand painted armored terrorist vans out the front of the station. I could not see any of the guys in their rising sun uniforms. Right next to where the racist idiots had parked is this train dressed up in Christmas lights driven by Santa. 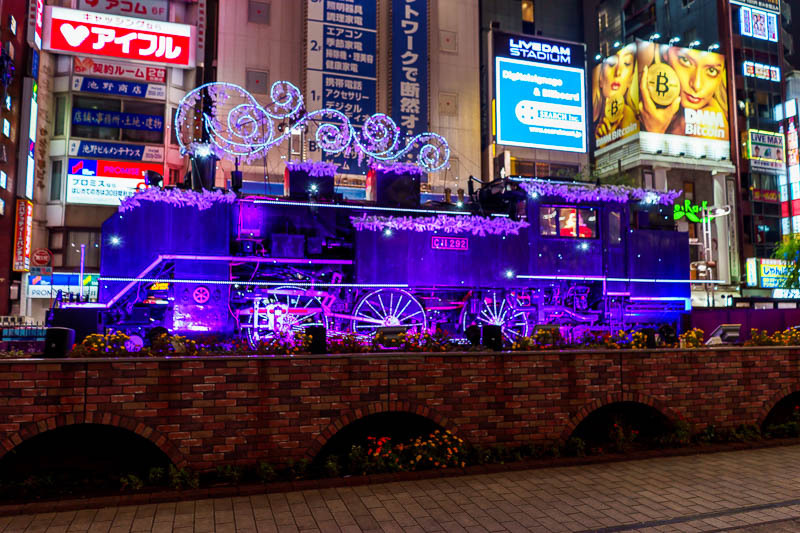 Perhaps the Japanese KKK had bought their kids to see the Santa train? 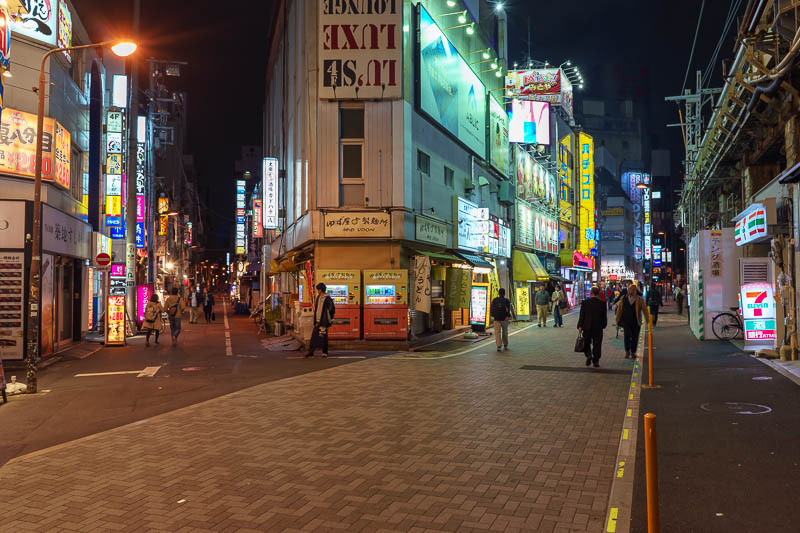 Here is a Shimbashi back street, about half the places are open. 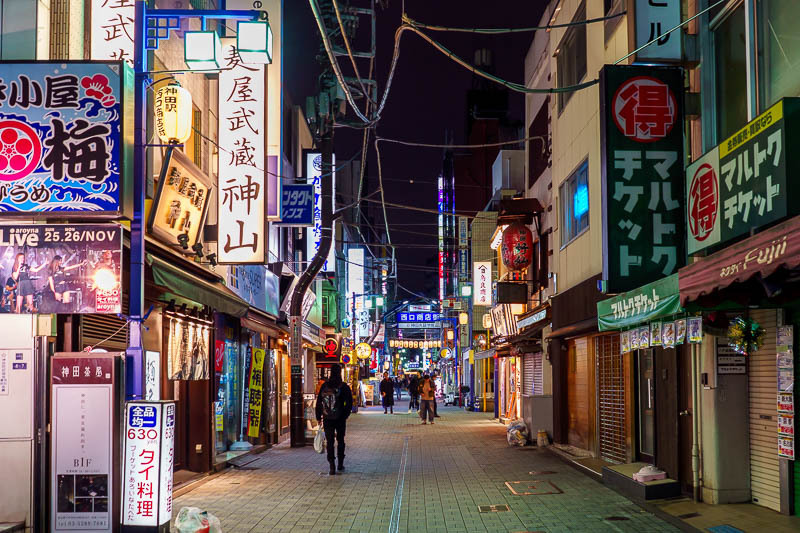 This is probably the main back street, theres also a main street but thats just filled with brand name shops and convenience stores. 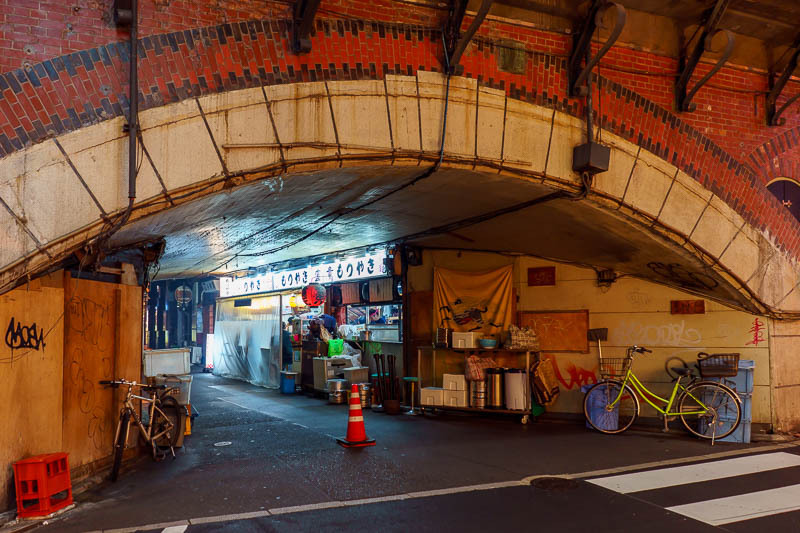 Time for one last photo of the restaurants under the tracks. I like this one. 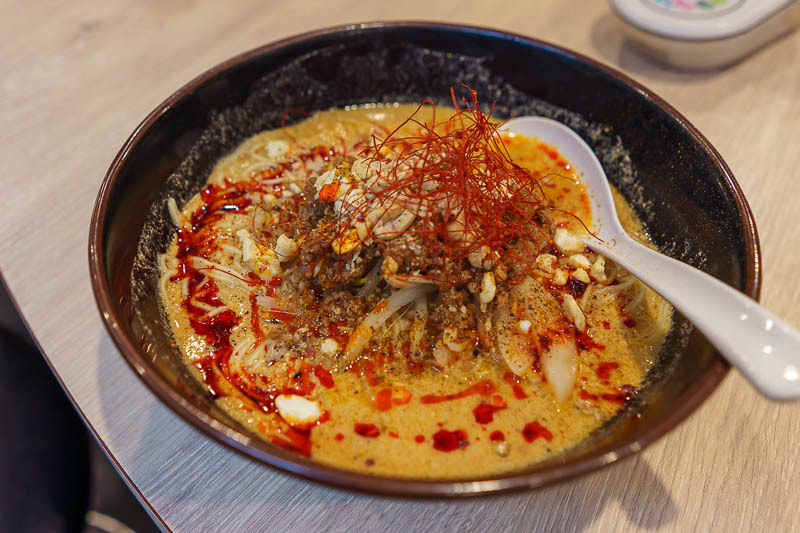 I was told I should have a traditional dinner, so I had Sichuan fusion Ramen, the least traditional thing I could find. It was delicious! It was inside a place where you can still smoke, I thought that had been banned? Generally the smoking places have better food! Probably because the smokers have killed all their taste buds with tongue cancer.